Ukiah, CA......This Saturday night, June 23, the North State Modified Series, presented by Protect the Harvest, comes to Ukiah Speedway for race #4 of its “2018 Driving Out Cancer Tour.” North State Drivers, crews and families have dedicated this season to bringing cancer awareness to the race fans. Saturday will be the only time that the North State Modifieds will compete at Ukiah in 2018. 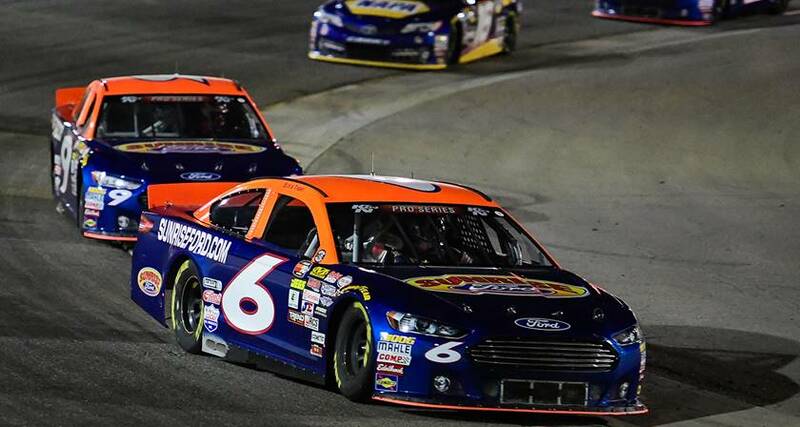 The NSMS points battle has flip-flopped from last season. This time last year the top five contenders hailed from Lake County. Now the top two, Kris Price and Jason Philpot, come from Sacramento. Price leads the way by 14 points. Kelseyville's Eric Johnson sits third in points with Dustin DeRosier, Cloverdale, fourth and Darrin Sullivan, Kelseyville, fifth. Thirty drivers have raced with NSMS in 2018 with an average car count of 19. More local cars are expected to show up for the Ukiah event. Practice will begin on Friday at 4 pm. Qualifying, the Lucas Oil Dash for Cash, and the Protect the Harvest 60 lap main event will be on Saturday. The North State Modifieds will join the local Bandoleros, Bombers, and Legends Cars. The Nor-Cal Pro-4 mods will also be on the racing cars. For rules, a NSMS schedule, or more information visit www.NorthStateModifieds.com. Eureka, CA (June 11, 2018) – Racing returned to Redwood Acres Raceway on Saturday for the fourth race of the 2018 season. 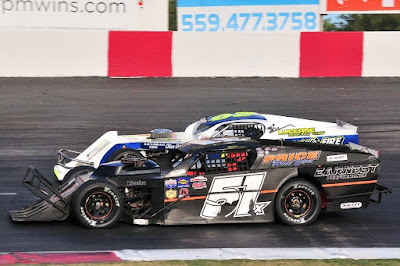 All six divisions were in action for Renner Petroleum Night at the Races including the Super Six Late Model Challenge Series cars which last raced on May 12th. Fast time for the Compass Community Credit Union roadrunners was Daniel Buell with a 20.565. Main event one was dominated by Buell. Tim Ratzlaff got past Buell on lap eight but had to surrender the lead on lap 10 as he broke the 21-second barrier. Buell was able to pull out a substantial lead while Ratzlaff had to do all he could to close in on the leader. Ratzlaff finally caught up to Buell with three laps remaining and maneuvered by to take the lead. At the checkered flag it was Ratzlaff winning over Buell, Ronny Crump, Lindsey Zito and Allan Anderson. Zito led the field to the green in the second main but Nick Ford quickly took over. Ford led up to lap 11 until he broke the 21-second rule and had to give up the lead to Ratzlaff. The three cars of Ratzlaff, Buell and Ford had a great battle for the lead. With four laps remaining, Buell was able to take over the lead. He was able to maintain that lead from that point on to take the victory. Ratzlaff took second while Crump, Ford and Jacob Wilkinson rounded out the top five. Lane Anderson set fast time for the Bandolero cars. Anderson took the trophy dash win while Maleesa Miles was the heat race winner. Miles and Anderson had a spectacular race from the drop of the green flag. Anderson dogged Miles all race long. Miles got loose on a few occasions but was able to maintain the lead on Anderson. The two drivers were never more than less than a car-length apart. At the finish it was Miles winning flag-to-flag just narrowly over Anderson and Kimberling. Qualifying for the NorthCoast Lighting & Electric was paced by Chris Lawrence at a 18.241. The trophy dash was won by Tyler Peach while the two head races went to Brandon White and Lawrence. Katina Baker took over the lead for the first four laps before giving way to Lawrence. His closest competition came from White. Lapped traffic played a role in the last half of the race. White was able to close in on Lawrence several times, including finding himself inside of Lawrence. In spite of White’s pressure, Lawrence kept his cool and was able to cross the line first at the finish. White placed second while Aiden Daniels, Wyatt Hobart and Baker finished the top five. Ryan Walters was the fastest in qualifying for the Fortuna Wheel & Brake bombers at a 18.332. Sam Brown won the trophy dash after Walters and Jim Redd got together. Walters recovered to take the heat race win. Wyatt Roach took the lead and he and Walters had a race-long fight for the lead. Walters stayed on Roach’s bumper and with less than five laps remaining it appeared as thought he was going to make a serious challenge for the lead. With three laps to go, Walters got loose coming off turn four allowing Roach to pull away. At the finish it was Roach winning. Walters, Redd, Bethany Rapp and Brown rounded out the top five finishers. In the Humboldt Hydroponics mini stocks, Brian Murrell, Sr. was quick time setting an 18.899 qualifying effort. The trophy dash was won by Gary Klientobe while the heat race victors were Trevor Eacret and Eugene Palmer. Several caution flags slowed the feature event. The most notable when it appeared Klinetobe hit the wall between turns one and two. Eacret led most of the race but had his hands full with Murrell, Sr. who was right in his mirror. Murrell, Sr. swept into the lead with five laps remaining. Murrell, Sr. was able to hang on to the lead and take the win over Palmer, Eacret, Brian Murrell, Jr. and Jordan Paiment. Fast time for the Mid-City Motor World Super Six Challenge Series late model cars was David Henderson 15.874. The first heat was won by Kenny Demello while Marty Walsh’s win in the second heat granted him pole position for the main event. The 60-lap feature event presented by NorthCoast Lighting & Electric was slowed from the start when Scott Baker got loose crossing the start line and sliding into the mud created by rain earlier in the day. The restart was clean and Walsh immediately jumped to the lead. David Henderson slotted into the second position and did his best to try and chase down Walsh. As the laps clicked off, it appeared as though Walsh had the race-winning car. He had a substantial advantage over Henderson and the rest of the field. Mic Moulton passed Henderson on lap 30 and made his try to challenge Walsh. At lap 40, it was heartbreak for Walsh as his car lost power down the straightaway. Moulton moved to the lead while Walsh had to limp his car to the pits. Henderson made one last run on Moulton in the final five laps but time ran out for him. Moulton was able to take the victory, his third straight of 2018. Henderson was second. Dennis DelBiaggio was third in his first race of the season. Kenny Demello was fourth while Ken Hallis had a solid run with a fifth. Second place finisher Eric Price II of Rio Linda collected $800 plus a $150 WLM&D bonus. Kris Price, Sacramento, finished third and took over the NSMS points lead from Randy Houston who missed the race due to prior commitments. Kelseyville's Eric Johnson placed fourth and moved up to third in the points standings, and Brian Collins of Camino finished fifth. Eric Price II set the fastest time during the WLM&D time trials with a 15.029 second lap, only .45 of a second quicker than Austin's 15.074. Price drew the number 6 pill for the invert in the 60 lap feature putting Las Vegas driver Aaron McMorran and Kelseyville's Darrin Sullivan up front for the start. Second row starters were Redwood Acres Raceway winner Jason Philpot of Sacramento and Terry Deal of Roseville. Only one lap had been completed when McMorran and Sullivan made contact, sending them both spinning in front of the tight pack. Both Philpot and Deal were collected in the incident while Austin, Eric Price, Kris Price, Darrin Knight and Johnson slipped through. The leaders stayed grouped up until lap 14 when the yellow flag flew for a spin in turn two involving Rich Cobb and McMorran. McMorran retired the the pits, but Cobb continued. Just as the pack was coming down to take the green flag for the restart, the 87 car, driven by Eric Hamilton, lost power and stalled on the back stretch for another yellow flag. The next time the race tried to restart, Darrin Knight's transmission broke and his car stopped on the track. When racing finally resumed Austin continued to lead as a mid-race battle was brewing with Collins and Johnson swapping places on each lap. Deal, Philpot, and Sullivan fought their ways back through traffic as the race continued non-stop the final 47 laps. At the checkered flag the leaders were nose-to-tail with Austin the winner over Eric Price, Kris Price, Johnson, Collins, Deal, Philpot, Sullivan, Ian Eliott, Keith Bloom, Dustin DeRosier, Cobb, Herman Pulyer, Adam Coonfield and Rick Avila. McMorran was the $100 winner in the Lucas Oil Dash for Cash, and Philpot collected $50 for his second place finish. Bloom earned the Keyser Hard Charger award for starting last and finishing 10th. Deal won the Naake Shocks certificate, and the Frank's Radios awards went to Austin and the Price brothers. Scribner Plastics jug were presented to Eric Price. Race #4 of the North State Modified Series “Driving Out Cancer Tour” will be at Ukiah Speedway on June 23. 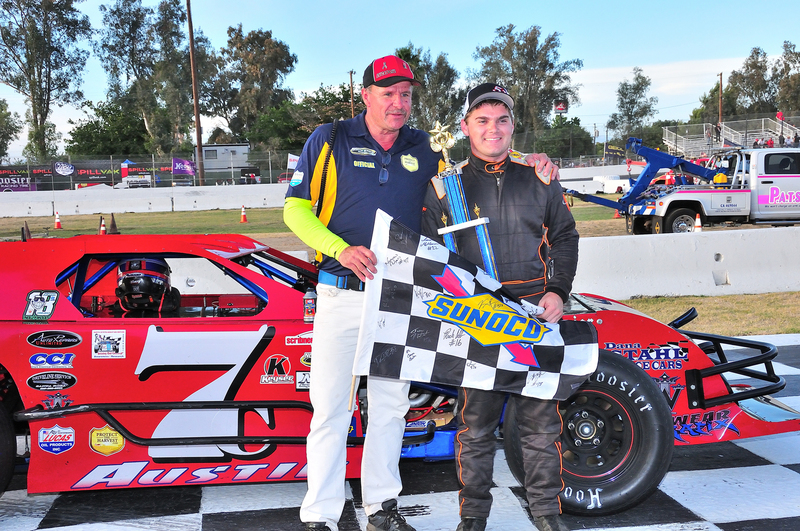 MADERA, CALIFORNIA (June 9, 2018) – Taylor Miinch led only the final five laps in the SpillVak 75 presented by Protect the Harvest towards a remarkable fifth straight Lucas Oil Modified Series win. The victory at Madera Speedway is his ninth win out of his last 20 series starts back to July of 2016, extending the 2017 champion’s points lead as well. Miinch qualified sixth out of the 25 car field, and started sixth after missing the five car inversion. The race was televised for MAVTV for a later broadcast date as well. 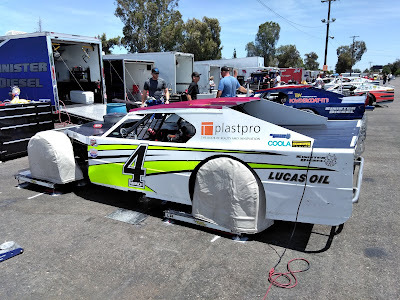 Former series champion Dylan Cappello of Peoria, AZ started on the pole in search of his third Madera win, and led the opening five laps. Scott Winters charged from fourth to lead lap six before a caution flew. Leading rookie Justin Johnson of Pahrump, NV made contact with fast-time qualifier Kyle Tellstrom of Boise, ID, sending him for a spin in turn four. Both had to restart at the rear. Dash winner Cappello took the lead back from Winters on lap six when Sierra Furia spun in turn one. Furia then nosed up the hill on the ensuing restart with a flat right front tire and additional damage that ended her evening. Cappello led lap seven before Winters grabbed the top spot on lap eight. Jason Irwin of Albuquerque, NM led lap 17 but Winters fended him off as well for the lap 18 lead. Things settled down in the torrid duel up front, briefly, until lap 26 when Cappello pulled off a slide-job style maneuver in turn two. It allowed the former dirt Micro Sprint racer to wrestle the lead back away from Winters. Taylor Miinch assumed third by lap 36 while Kyle Tellstrom had advanced up to sixth by lap 42 with Johnson seventh in tow. Miinch took over second and put his head down to try to close on Cappello in the final ten laps. With five to go, Cappello spun with an apparent mechanic failure in the rear end. He came to a stop in turn one to surrender the lead on lap 70. Miinch led the field back to the green but the race was immediately red flagged when Winters and Idaho’s Shelby Strobel made contact coming out of turn four. Their resulting spin into the wall saw Irwin, Johnson, Tellstrom and several others suffer various degrees of front end damage as they came to a stop. The track was blocked with both Winters and Strobel done for the evening. The extended red flag allowed Cappello’s team to attempt repairs but they were unsuccessful in getting their car to refire. The heavily wounded #17 of Justin Johnson restarted behind Miinch but could not make a move as Miinch drove off to a 1.679 second victory. 15 year-old Ryan Schartau worked his way past Jason Irwin for a narrow third. Cody Kay of Reno, NV rounded out the top-five. The Driving Out Cancer 60 presented by Protect the Harvest for the North State Modified Series served as the undercard with 18 Modifieds on track. Aaron McMorran of Las Vegas, NV brought the field to green after a six car invert but was tagged on the second lap by Darrin Sullivan. Sullivan and McMorran spun out of turn four and collected Terry Deal and Jason Philpot as well. All four drivers were relegated to the rear. Legends graduate Cameron Austin assumed the top position and faced early company from sixth starting Kris Price, the winner of the Shasta North State event earlier this year. 11th starting Brian Collins avoided the earlier crash and made some additional passing moves to challenge for a top-five position throughout much of the feature. Lapped traffic became a factor by lap 30 when Eric Price, Jr. tried to close in on Austin. Traffic proved to be the undoing for Price at least initially as he searched for racing room high and low. Austin took off for a commanding and insurmountable lead of 3.166 seconds at the checkered flag. The victory was Austin’s first in the North State Series. Eric Price and Kris Price rounded out the top-three. Eric Johnson was a steady fourth while Brian Collins held off Terry Deal for fifth. Adam Lemke of Hollister continued his winning ways in the USAC Western US Midgets to continue his reign at the top of the championship. While he was up front, the battling for the second position intensified between Cody Jessop and Goodtimes QMA graduates Joey Iest and Blake Brannon. Iest impressed when he got around both drivers to take the second position, while Brannon slowed on the final lap of the feature to have to settle for fourth. Lemke, Iest, Jessop, Brannon, and Joey Nichols made up the top-five. The CSS 360 Super Modified race was a runaway for AJ Russell of Clovis for his first win of the season. Russell looked to make a statement after being locked out of victory lane in the first two rounds, nearly lapping the entire field. A caution flew on lap 25 when Ed Rodriguez went up in smoke down the front stretch and lengthy cleanup necessitated ending the race five laps early. Russell grabbed the yellow checkered victory ahead of Donnie Large, Jr. and Lance Jackson. Madera Racing on MAVTV airs Thursdays re-runs of the 2017 season every week. The show airs at 5 p.m. and 8 p.m. PST and is also available on the Lucas Oil Racing TV app. New 2018 episodes air every other week, with the round #1 of the 51FIFTY Energy Drink Jr. Late Models airing June 21st.